Pre-ordering Resident Evil 6 will net Umbrella fans an Umbrella umbrella. 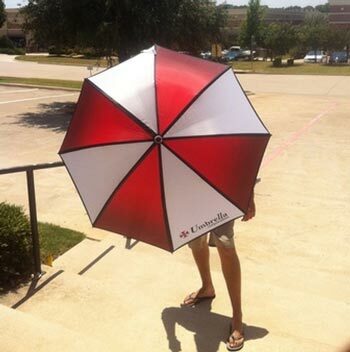 If you pre-order Resident Evil 6 from Capcom's official US storefront, you can get your zombified mits on the "Premium full-sized Umbrella Corporation Umbrella." I bet it was pats on the back all round when the marketing department came up with that one. The umbrella is decorated with Umbrella's distinctive red and white color scheme and sports the tiny mini-umbrella Umbrella logo. It also has the word "Umbrella" written on it, which will make you look like the kind of person who needs a label that says umbrella on your umbrella. Don't be surprised if your fellow pedestrians give you odd looks and occasionally ask if you're a bit lost, in other words. Unfortunately, in the case of complete global saturation, or a light drizzle, only American gamers will be sporting the Umbrella umbrella, as the bonus appears to be limited to the US. Capcom's blog notes that supplies of the Umbrella umbrella are limited. Resident Evil 6 shambles onto shelves October 2nd for Xbox 360 and PS3, with a PC version to follow eventually.